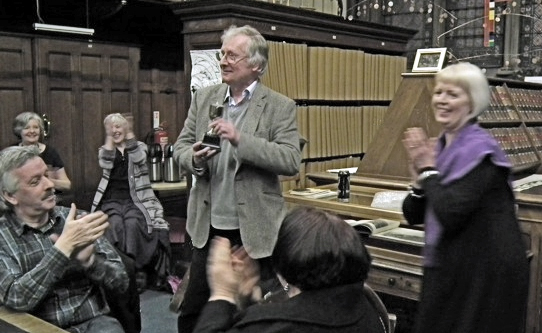 At a recent event in the Mining Institute, Newcastle upon Tyne, Ward Wood poet Dr Keith Armstrong was presented with the inaugural Northern Voices Lifetime Achievement Award by Newcastle poet Catherine Graham in front of a packed audience. Born in Heaton, Newcastle upon Tyne, where he has worked as a community development worker, poet, librarian and publisher, Keith Armstrong is a pioneer of many creative writing and community publishing enterprises specialising in recording the experiences of people in the North East of England. He has organised several community arts festivals in the region and many literary events featuring the likes of Yevgeny Yevtushenko, Douglas Dunn, Barry Hines, Linton Kwesi Johnson, Katrina Porteous, Ian McMillan, Edward Bond, Edwin Morgan, Uwe Kolbe, Attila the Stockbroker, Jon Silkin, Ivor Cutler, Adrian Mitchell, Jackie Kay, Benjamin Zephaniah and Liz Lochhead. He was founder of Ostrich poetry magazine, Poetry North East, Tyneside Writers' Workshop, Tyneside Poets, East Durham Writers' Workshop, Tyneside Trade Unionists for Socialist Arts, Tyneside Street Press and the Strong Words and Durham Voices community publishing series. He has recently compiled and edited books on the Durham Miners’ Gala and on the former mining communities of County Durham and the market town of Hexham. He has been a self-employed writer since 1986 and he was awarded a doctorate in 2007 for his work of Newcastle writer Jack Common at the University of Durham where he received a BA Honours Degree in Sociology in 1995 and Masters Degree in 1998 for his studies on regional culture in the North East of England. His book on Jack Common 'Common Words and the Wandering Star' was published by the University of Sunderland Press in 2009. His poetry has been extensively published in magazines such as New Statesman, Poetry Review, Dream Catcher, Other Poetry, Aesthetica, Iron, Salzburg Poetry Review, Sand, X Magazine, The Poetry Business, and Poetry Scotland, as well as in the collections The Jingling Geordie, Dreaming North (with Graeme Rigby), Pains of Class, Imagined Corners, Splinters and The Month of the Asparagus, on cassette, LP & CD, and on radio & TV. He has also written for music-theatre productions, including 'O’er the Hills’(with Dreaming North - Graeme Rigby, Rick Taylor, Paul Flush, Joan McKay and Keith Morris, with guest Kathryn Tickell,) and ‘Wor Jackie’ (with Mike Kirkup) (1988) for Northumberland Theatre Company; ‘Pig’s Meat’ (1997 & 2000) for Bruvvers Theatre Company; and ‘The Roker Roar’ (1998) for Monkwearmouth Youth Theatre Company. Other commissioned work includes ‘Fire & Brimstone’ (with Linda France, Paul Flush and others) (1989) and ‘The Hexham Celebration’ (with Paul Flush and others) (1992), both for the Hexham Abbey Festival; ‘Suite for the River Wear’ (with Dreaming North) (1989) for BBC Radio; and ‘The Little Count’ (with Andy Jackson and Benny Graham) (1993) for Durham County Council. He won the Kate Collingwood Bursary Award in 1986. He was the Judge for the Sid Chaplin Short Story Awards in 2000. He has performed his poetry on several occasions at the Edinburgh Fringe Festival and at Festivals in Aberdeen, Bradford, Cardiff, Cheltenham (twice at the Festival of Literature - with Liz Lochhead and with 'Sounds North'), Durham, Newcastle upon Tyne, Greenwich, Lancaster, and throughout the land. He has read in Newcastle at the Morden Tower, Swarley's Club, The Blue Room & The Baltic, at Durham's Colpitts Poetry, Tees Valley's Write Around & Writers' Cafe, Leed's Wicked Words, York's Riverlines, Lincoln's Spoken Word, Liverpool's Stamps, Sheffield's Antics, Bradford's Grey Sheep Cabaret, Aberdeen's Springtides, London's Apples & Snakes, at the Universities of Bath, Durham, Newcastle and Warwick, in Edinburgh at the Scottish National Poetry Libraryand the Royal Oak and Diggers venues and in Limerick at TheWhite House and On the Nail venues. He has received an Arts Council of Northern Ireland grant to visit Belfast and Northern Cultural Skills Partnership grants to attend conferences in Bath, Leeds and London. In his youth, he travelled to Paris to seek out the grave of poet Charles Baudelaire and he has been making cultural pilgrimages abroad ever since. He has toured to Russia, Georgia, Bulgaria, Poland, Iceland (including readings with Peter Mortimer during the Cod War), Denmark, France, Germany (including readings at the Universities of Hamburg, Kiel, Oldenburg, Trier and Tuebingen), Hungary, Italy, Ireland, Spain, Sweden, Czech Republic, The Netherlands, the United States, Cuba, Jamaica and Kenya. His poetry has been translated into Dutch, German, Russian, Italian, Icelandic and Czech. He has long pioneered cultural exchanges with Durham’s twinning partners, particularly Tuebingen and Nordenham in Germany and Ivry-sur-Seine and Amiens in France, as well as with Newcastle’s Dutch twin-city of Groningen. In fact, he has visited Tuebingen some 30 times since he first spent a month there in November 1987 as poet-in-residence supported by Durham County Council and the Kulturamt, and he has performed his poetry in the city’s Hoelderlin Tower and, on three occasions, as part of the annual Book Festival. He has arranged for writers such as Katrina Porteous, Julia Darling, Michael Standen, Alan C. Brown and Linda France to join him in Tuebingen. He has also won Northern Arts Awards to visit Berlin in 1990, in 2001 to pursue his studies of Dutch regional culture, and in 2003 to visit Prague (with poet Paul Summers). His travels to Denmark, Germany, Holland and Sweden have also been supported by the British Council. By way of cultural exchange, he has arranged for visits to North East England by poets from Scotland, Germany, The Netherlands, the Czech Republic, America and Russia. He often works and travels with folk-musicians from North East England, including Jez Lowe, Marie Little, Gary Miller and George Welch, and he has written the lyrics for an album, 'Bleeding Sketches', by folk-rock band ‘The Whisky Priests’, with whom he has toured extensively in The Netherlands. He has also visited the European Parliament in Strasbourg to perform his poetry with musicians Pete Challoner and Ian Carr. He has recently inspired songs by Jez Lowe and by Joseph Porter of Blyth Power.